Sciatica is caused by pressure on the sciatic nerve – a very large nerve that originates from the lower lumbar spine and travels through the buttock into the leg as far as the back of the knee and to the foot. 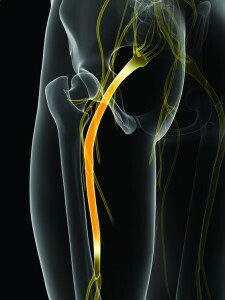 Sciatica is characterized by pain, numbness, and weakness in the legs. Commonly pain and numbness are located at the calf, foot, or back of the thigh. This is usually preceded for a few weeks by lower back pain. Eventually the leg pain becomes worse than the back pain. Pain can either be dull and aching or can be a shooting pain down the leg all the way to the toes. This pain can last for several days or weeks or it can subside for even a few hours. However, someone who has had sciatica for a long period of time will find that the pain localizes in the buttock and thigh. In severe cases it can damage nerves and reflexes or cause the calf muscle to deteriorate. In addition to this, you will be given a series of home stretching exercises and asked to apply ice and heat to help aid your recovery. If you are suffering with sciatica at the moment please do not delay – you can achieve the best results when you address the symptoms early. Please contact us to begin your care today!